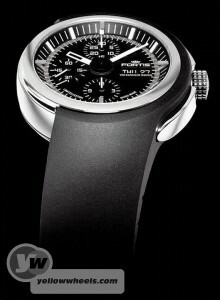 It’s called Spaceleader, and follows in a line of Fortis watches using spacey names since the ’70s. Why Volkswagen should step in at this point and lend its name and design team is anyone’s guess. But the result is a rather slick shape with some of the purity of line and functional clarity of the car group and the technical know-how of a Swiss watch maker. 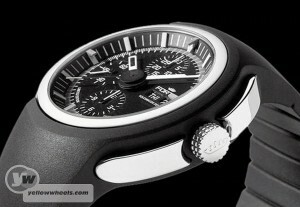 Porsche have been making watches bearing their own moniker for some time, and so indeed have many other manufacturers. Maybe the successful marketing synergy of the Bentley + Breitling brands has encouraged Volkswagen Group to expand the idea down the range. Clearly, it’s not sufficient to simply make cars without a long list of secondary accoutrements branded, but manufactured elsewhere, to fill the showroom display cabinets and add some well needed glitz to the marketing of motors. We actually quite like the styling, although the instrument face is a little cluttered. What we don’t particularly like is the thickness of the watch. If size in a timepiece is a positive, weight and thickness surely aren’t. 2012 of these watches will make it to the marketplace: a limited edition designed to celebrate the 100th anniversary of Fortis watches, guess what, in 2012. Seems to us, a strange but privileged decision, to award the design of a hundredth anniversary design to a car company, bravo VW ! In collaboration with Swiss watchmaker FORTIS, Volkswagen designers have produced a distinctive and high-tech chronograph timepiece which has already received international recognition for its design. The Volkswagen Design team, commissioned by FORTIS, prepared a concept for a new Spaceleader model drawing inspiration from the elegance and simplicity that epitomises Volkswagen Design for the concept of the final piece. Presented in a polished steel case behind anti-dazzle sapphire glass, the automatic chronograph with its striking black dial and contrasting white accents is embedded in a black caoutchouc rubber strap with a butterfly folding clasp. The combination of traditional premium precision and cutting edge design has produced a timepiece which has already achieved recognition being awarded three of the most international renowned design awards before being officially unveiled. The piece has been honoured with the coveted iF Product Design Award 2010, a hallmark of fine design since 1953 as well as the red dot design award – honourable mention 2010. The Athenaeum Museum Chicago, which has been recognising excellent design since 1950, has also awarded the watch its prestigious GOOD DESIGN Award. 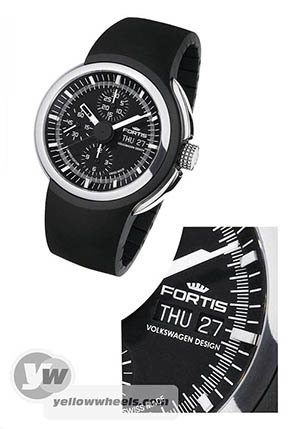 Production of the FORTIS Spaceleader Chronograph by Volkswagen Design will be limited to 2012 units.